We visited the Corn Refiners Association (CRA) and the Food and Drug Administration (FDA) for some background on the sweetener many people love to hate. Corn syrup is made from corn starch, which is found in the kernels (seeds). Starch is made up of a chain of glucose (a simple sugar) molecules joined together. The corn starch is broken into singular glucose molecules by adding water and enzymes produced from bacteria and fungus. If this already sounds horrifying to you, these enzymes may also be used in the production of other sweet syrups, such as maple and sorghum, to prevent crystallization. Honey bees also excrete an enzyme to their collected nectar which helps in the honey-making process. The syrup created from the first enzyme process is pure glucose. To create a high fructose version, they add another enzyme. HFCS can be 55% fructose/45% glucose, or 42% fructose/58% glucose, depending on the sweetness desired. A high maltose corn syrup can also be created, but it is not as commonly used as HFCS. Why are corn syrup used in place of sugar? 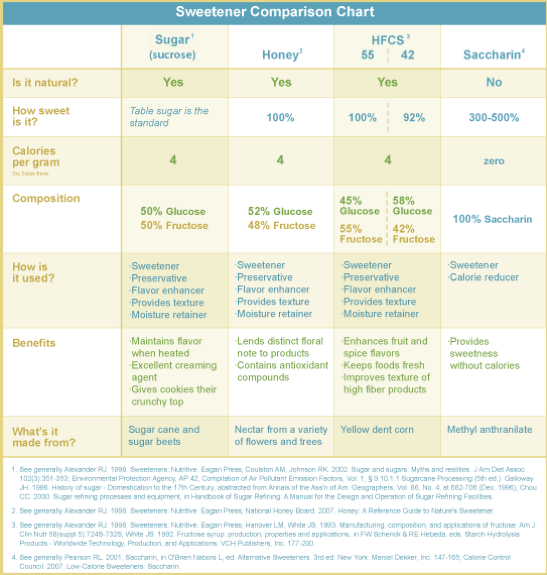 The FDA is not aware of any evidence, including the studies mentioned above, that there is a difference in safety between foods containing HFCS 42 or HFCS 55 and foods containing similar amounts of other nutritive sweeteners with approximately equal glucose and fructose content, such as sucrose, honey, or other traditional sweeteners. The 2010 Dietary Guidelines for Americans recommend that everyone limit consumption of all added sugars, including HFCS and sucrose. FDA participated in the development of the Dietary Guidelines and fully supports this recommendation. What we’ve learned, through talking with an esteemed expert on the subject, is that HFCS has gotten a bad rap and has been unfairly targeted. To set the record straight, we spoke with Dr. John White, M.D., Founder and President of WHITE Technical Research, and one of the leading experts in fructose and HFCS – the result of nearly 30 years of research on sweeteners. Read on for a biggest takeaways from our discussion.